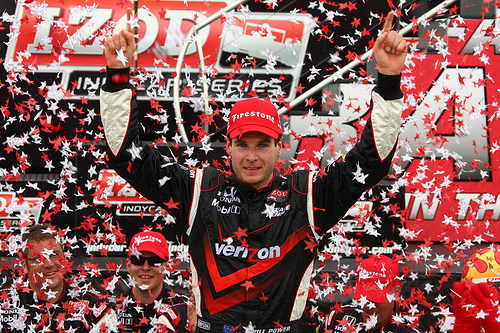 Leave it up to the quiet speedster, Will Power, to be the voice of reason with all the frothing going on over the IndyCar Vegas finale. I had just put the finishing touches on my list of five favorites ("Cha Cha" Muldowney, Alberto Contador, Shaun White, Kenny Roberts, and Joey Chestnut) when William had to get all up and reasonable in this piece by Marshall Pruett. Yea, no joke. 220, 221... whatevs. Four open wheels and a bunch ballers vying for the season IndyCar crown is no place for Dennis Anderson, or the like. It's the proverbial double-edged sword: in some ways, you want the drivers with the least experience, for the pub; on the other hand, the ones with the most experience, for safety and to maintain the integrity of the event. So, Randy, when it comes to the Sin City Shootout, I am ALL IN, bud. But let's keep the sentiments of one Willy P. in mind: sometimes, even in Vegas, you have to play it SAFE.